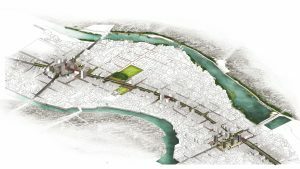 Despite being one of the fastest growing and most densely populated cities in the world, Dhaka has a rudimentary transportation system with some unique characteristics (e.g. absence of properly planned and organized mass transit system, excessive number of NMTs, dearth of road space which is shared by heterogeneous traffic mix etc.). With huge population of over 15 million, over concentration of both motorized and non-motorized vehicles and that of the mobility, inadequate transportation facilities and policies, varied traffic mix, absence of dependable public transport system and inadequate traffic management practices and parking facilities have created a significant worsening of traffic and environmental problems in Dhaka. 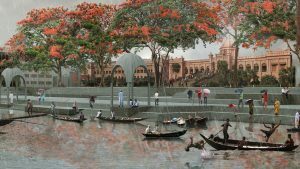 The only solution for the traffic and transportation problem in Dhaka is Public Transport and Mass Rapid Transit System which can serve maximum people with minimum traffic. 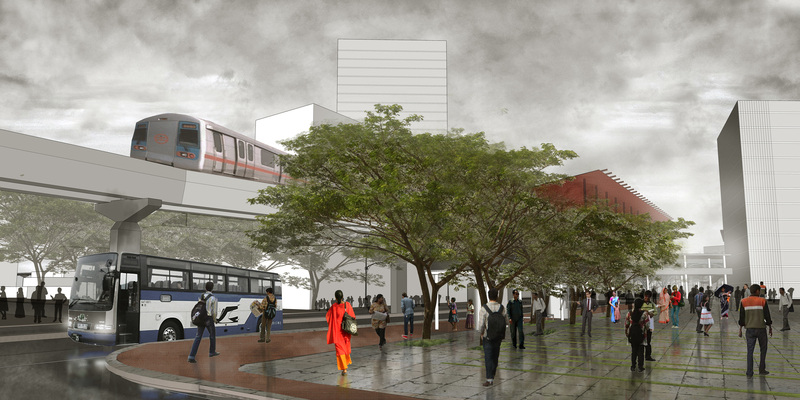 Public Transport system does not only circle around with the problems of mobility but it is also an integrated vision comprising urban culture, environment, infrastructure and social structure. 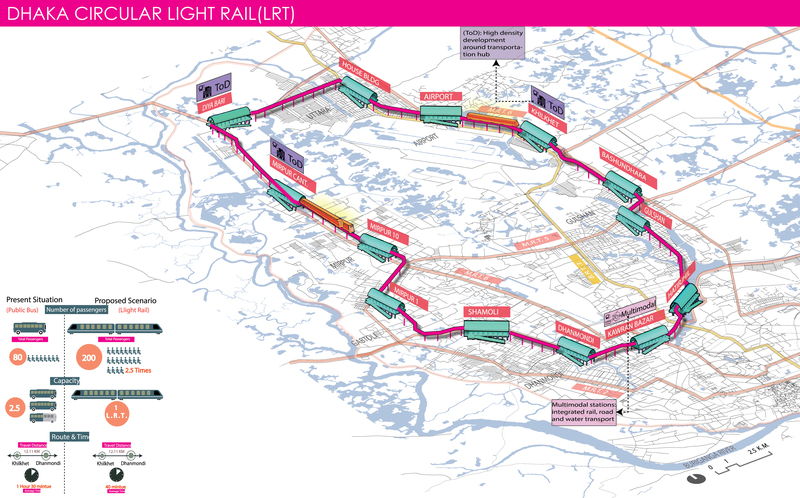 The proposed Light Rail Transit (LRT) will operate as a circular line passing through Uttara, Airport, Khilkhet, Badda, Gulshan, Tejgaon, Kalabagan, Dhanmondi, Sher-e-bangla Nagar, Adabor (Shyamoli), Mirpur, Pallabi and Turag. The line will also board and alight passengers from nearby Dakshinkhan, Rampura, Ramna, Shahbagh, New Market, Mohammadpur and Kafrul area. The line will serve from about 2 million to more than 3.5 million people depending on various aspects (e.g. station location, feeder service, other provisions for better accessibility etc.). Number of total trips generated by these people ranges from 3.5 million to 6.8 million daily (30% of it have been assumed to be borne by the proposed LRT). For the circular line, an average of 1 km distance will be provided between the stations. 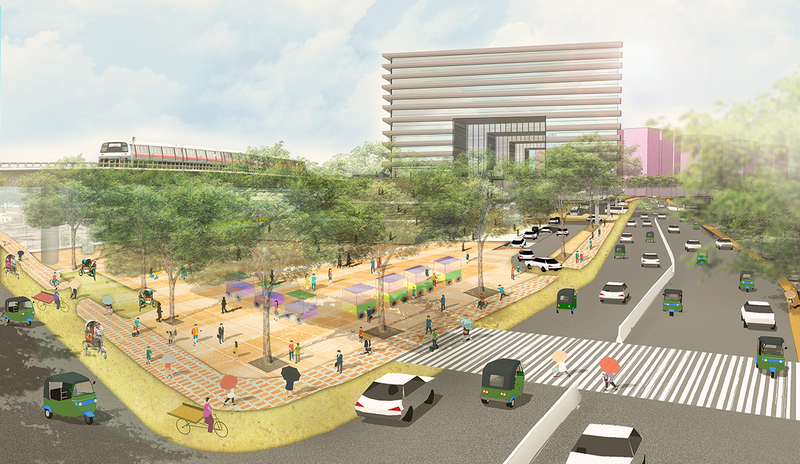 Also, location of important commercial, transport hubs and busy intersections will be in consideration while choosing the location of the stations. The number of total station is estimated as 40 (for a 42 km line). Assuming a 16 hour operation every day, passenger trips per hour will be from 68,750 to 125,000 respectively. Considering all the costs and taking account of the overhauling and replacement costs, the yearly operation and maintenance cost is approximated as 350 Crore BDT (44 million USD) per year. The estimated revenue will be between 1,700 Crore BDT (215 million USD) and 2,400 Crore BDT (305 million USD) per year for different but reasonable fare structures (i.e. the fare range should be between 50 and 200 Taka, the ridership should be satisfactory etc. ).